B3107 Holt Road (Part), South Wraxall and Bradford on Avon; from its junction with B3105 to its junction with Cemetery Lane. 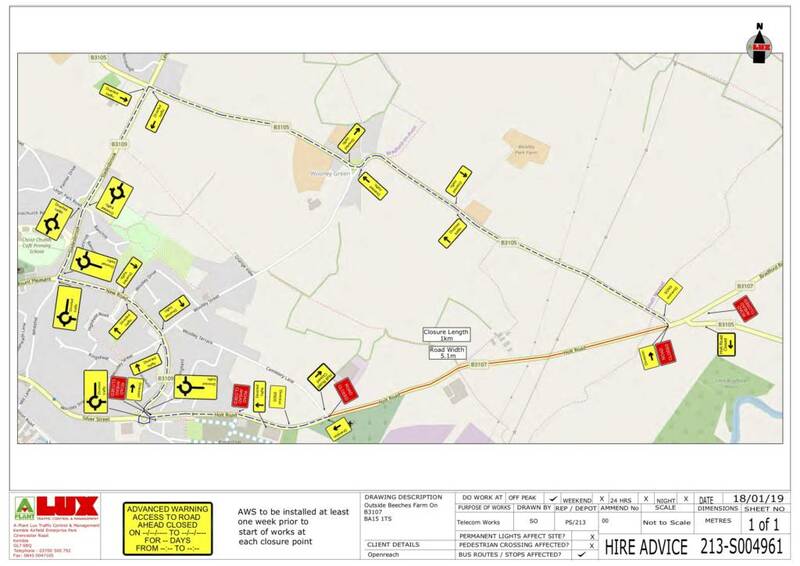 To enable: Openreach to carry out cabling for new customer connectionAlternative route: via B3107 (unaffected length) – B3109 – B3105 and vice versa.The closure and diversion route will be clearly indicated by traffic signs. This Order will come into operation on 23 April 2019 and the closure will be required between the hours of 09:30 and 15:30 until 25 April 2019. It is anticipated that the works will take the stated duration to complete depending upon weather conditions. Access will be maintained for residents and businesses where possible, although delays are likely due to the nature of the works. The Order will have a maximum duration of 18 months. For further information please contact Lee Clark (Barden Network) on 01454 281627.